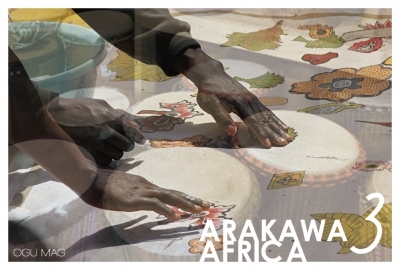 ARAKAWA AFRICA aims at providing a focus on unexpected networks between Africa and Arakawa ward in Tokyo through a series of exhibitions by several companies or groups connected with both areas. 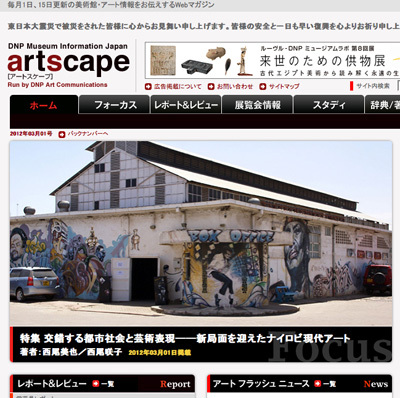 Since founded in Higashiogu in Arakawa, 2009, Nishio Workshop has worked on activities for promoting cultural exchange by contemporary arts in Nairobi, the capital city of Kenya. 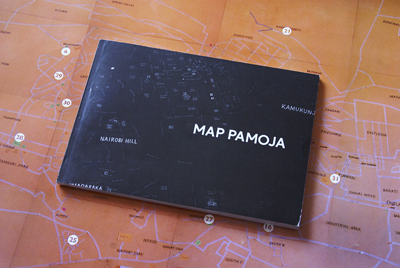 In this exhibition, it will exhibit and sell recent artworks, Kangaeru and Map Pamoja, which drew their inspiration from people, scenery and clothing of Nairobi. Tokyo Djembe Factory (TDF) / Africa-ya is a very unique shop in Machiya in Arakawa, in that a TDF chief, Kato, visits Mali every year to produce djembes and bring them back for sale, and also organizes workshops to provide opportunities for playing them. In the exhibition, it wil show many djembes which have different shapes from one another depending on countries where they were created, as well as a wide collection of pagne cloth in West Africa. Opening Reception: 4th(Fri), May, 2012. From 6:00pm to 9:00pm. Le Rustique Restaurant will present a solo exhibition by the first contemporary artist from Japan or Asia, Yoshinari Nishio and his artists collective, Nishio Workshop Nairobi. His works have consistently referred to relationships between fashion and communication, and developed art projects the world over, presenting novel angles on clothing and its potential power. The most of his production process are attained with the cooperation of citizens and students in public spaces where unknown passengers come and go. He established Nishio Workshop Nairobi Office in 2009 and started on alternative art projects in Nairobi. 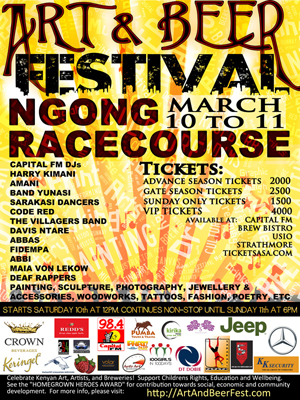 His artistic activities have been featured on Kenyan major newspapers and TV. 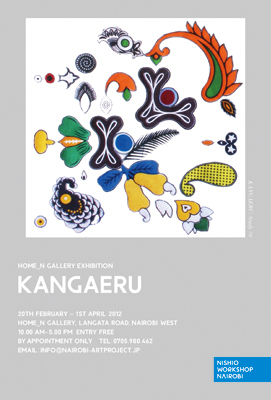 In this exhibition, we will exhibit a series of works titled KANGAERU that were produced through clipping and re-composing different patterns of Kanga, very traditional cloth from the East African region. 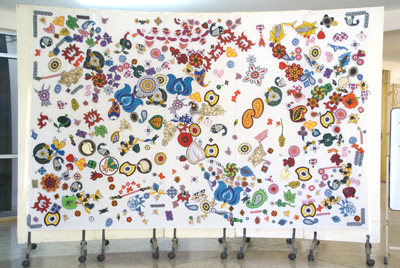 The patterns in different colors were set free from traditional arrangements and rules, seeked a new type of order and story by hands of the artist on one occasion, or by hands of participants into a workshop that was publicly held on the street on the other occasions, then they were transformed into a unique and beautiful form of patterns. In addition, the works of KANGAERU were put on by street vendors who always dress themselves in a variety of everyday products in a very unique way on the streets. Those street vendors walked step by step on a congested main road in Nairobi like on a catwalk in fashion show. The documenting photos of this performance will be exhibited. *The title KANGAERU means "contemplating or transforming Kanga" in the Japanese language. Born in Nara, Japan, 1982. He currently lives and works in Nairobi and Tokyo. He obtained Ph. D. in Fine Arts from Tokyo University of the Arts in 2011, then received grant from the Japanese Agency for Cultural Affairs to stay and work for 2 years in Kenya. His works have consistently referred to relationships between fashion and communication, developing art projects with the cooperation of citizens and students around the world. 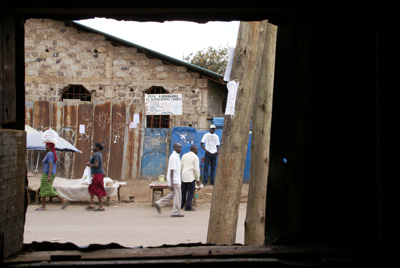 He established Nishio Workshop Nairobi Office in 2009, and started on alternative art projects in Africa. Based on the unique long-termed study on clothing through the lens of a contemporary artist, he also set up his own fashion label “Form on Words” in 2011. 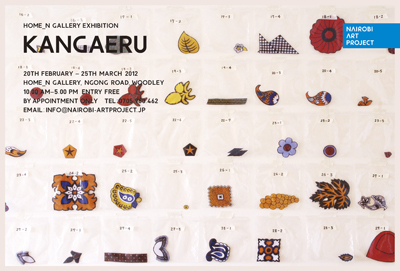 We've moved to a new place, and extended the exhibition period of "KANGAERU" until 1st April. Welcome to our new Home_N Gallery! In this exhibition "KANGAERU," we will present a series of works produced by clipping and re-composing different patterns of Kanga, very traditional cloth from the East African region. The title "KANGAERU" means "contemplating" or "transforming Kanga" in the Japanese language. By imagining Kanga's colorful and fabulous patterns as materials for painting, we can find new value and meaning in such familiar and common objects. In this exhibition "KANGAERU," we will present a series of works produced by clipping and re-composing different patterns of Kanga, very traditional cloth in East African region. The title "KANGAERU" means "complating" or "transforming Kanga" in Japanese language. By seeing Kanga's colorful and fabulous patterns as materials for painting,we could find new values and meanings in this familiar common object. 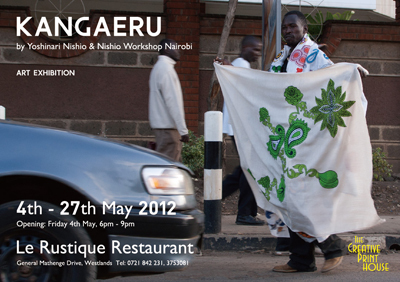 There is also a workshop space where you can experience production process of "KANGAERU" during the exhibition period.